Upon entering Sanctuary Cafe, the social justice–minded coffee shop that opened last year in Hyde Park’s University Church, I immediately noticed the wooden benches, the way the lamps light the space, and how the low chatter of people in the space all reinforce the idea of sanctuary, a safe space. 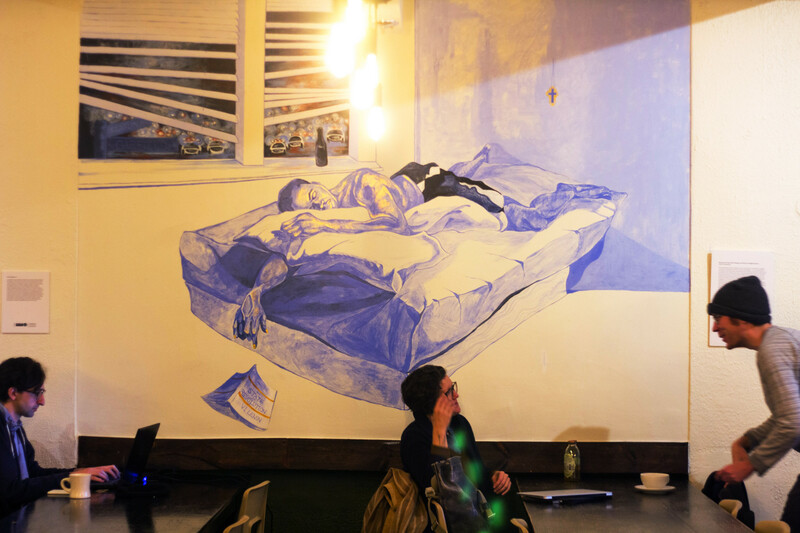 A triptych of murals on the far wall are part of artist-in-residence Katherine Cavanaugh’s collection “Blessed Are Those Who Hunger and Thirst for Righteousness.” Initially, the work conveys different ideas of safety to the viewer, whether through a physical space, an object, or even just a moment. But the work, especially its title, can also be seen as a catalyst or a motto for those who seek to find a path through passion and through helping others. Even before I knew anything about the work, I was drawn towards the second piece, in the middle. All three of the paintings include blue, white, black, and gold tones, but the way this central one utilizes space within and outside the painting stands out; Cavanaugh incorporates the white space of the wall into the piece. The way the man is lying on the bed to rest, his arms intertwined with the pillow and comforter, makes you feel like you’re sitting at the foot of his bed. Depending on your angle, the café lamps almost appear to be backlighting the man like street lights, the gold reflecting across his skin. At first, the scene appears to be a moment of peace, with a small cross hanging on the wall at the end of the bed. Taking a closer look, the scene outside the window is a completely different story: flashes of gold, blue, and red lights, a sea of police cars, and street signs that read Garfield and Laflin. One starts to wonder how the young man can sleep with everything going on outside his doorstep. Is someone after him? Is this scene the norm in his world, or are we witnessing something unique? What happened? For those of us who’ve lived on the South and West Sides of Chicago, we know this segregation of space all too well, with the boundaries of what is happening outside and inside oftentimes being blurred. The window blinds split and lay crooked, allowing the chaos of the street to bleed into the peaceful atmosphere inside. The next painting that drew my eye was the rightmost of the triptych. In this mural, two people observe a glowing sphere within a room. This environment is again very calm at first glance; the observers are entranced by the sphere, their attention undivided. A second look, however, reveals familiar elements of chaos: the eviction notice, the gun. The two people seem unconcerned with these looming threats. Like the man clutching his pillow, they savor a reprieve from the outside world, momentarily unaware of its existence. The third painting stands apart from the other two. Here there is no contrast between the subject and the environment. Inspired by a photograph taken by Irish Times photographer Brenda Fitzsimons, the mural depicts Bernadette Devlin McAliskey in Dungannon, Northern Ireland. McAliskey is a socialist Irish Republican activist, and, at the time, was the youngest person elected to British Parliament, at the age of twenty-one. In Cavanaugh’s painting, McAliskey stands in the street, contemplative and abstracted from her surroundings. The shadows of the ceiling lamps reflect across the painting, adding to the darker tones created by the blue and black hues. The gold hues highlight McAliskey’s face and arms, as well as the streetlights in the distance. The letters IRA emblazoned in the background hint that, here too, the stillness belies a deeper violence. Cavanaugh grew up in the rural Ohio college town of Oberlin, and became enamored by art as a child. She graduated from the Rhode Island School of Design in 2015. Throughout her time there, she began to question her own motivations. She felt that pursuing her personal interests as an artist was not as “morally correct” (as she put it in an interview) as becoming more politically or socially active. She had begun to face the question that many college graduates and young adults ace: Do I do what I like, or do I do what makes me money? Cavanaugh said that she assumed that she would have a minimum wage job and do what she could on the side. So the answer was to discard art for a while, at least until she had figured out how to sustain her life. After leaving her job as a home health aide, Cavanaugh moved to Chicago at the urging of a friend. She soon met two organizers of Stories Connect, a nonprofit writer’s collective that is one of the sponsoring organizations of Sanctuary Cafe. One recognized her from one of University Church’s services, and the conversation eventually turned to McAliskey. The other organizer mentioned that they were interested in getting more social justice artwork into the café. At first Cavanaugh neglected to think of herself as a possible candidate for the job, but as the conversation continued and she started talking about her experience with art and interest in murals, things fell into place. After Stories Connect proposed the idea, Cavanaugh started working as the artist-in-residence for the café. A common experience among creatives: the best connections often come from opening up to a random stranger about your life ambitions and opinions. 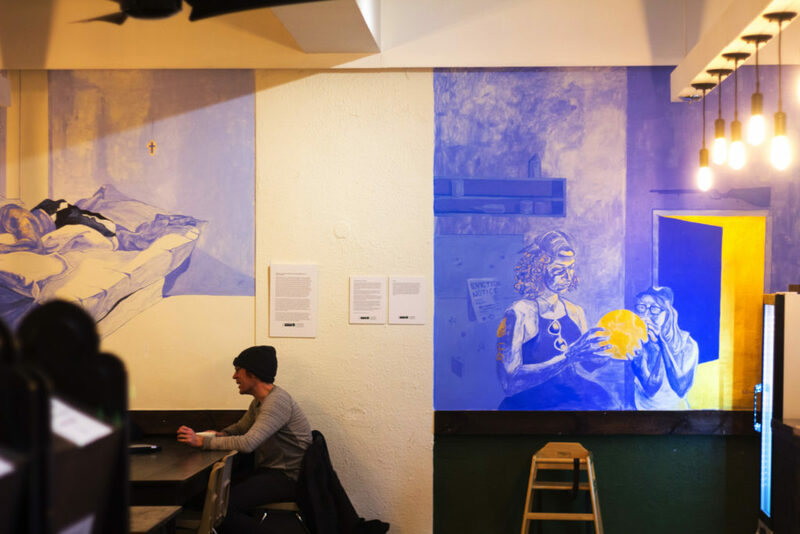 Cavanaugh’s murals will be up for public viewing until the end of February at Sanctuary Cafe, 5655 S. University Ave.
Rod Sawyer is a photojournalist based on the South Side, focusing mainly on covering graffiti and mural-art. He last wrote for the Weekly in October about the Shedd Aquarium’s summer mural initiative. Katherine Cavanaugh is an exceptionally gifted artist. She is one to watch in the coming years. Great to see Cavanaugh at it again. This is a modern day icon, exquisitely painted and soul piercing. Reminiscent of her murals in Rome. Extraordinary perceptions and art work. Profound!